ROAD TO RECOVERY NEEDS YOU. – Every day, patients in our area miss potentially life-saving cancer treatment appointments because they can’t afford transportation or are too ill to drive themselves. You can help, submit your contact information using the form below and a staff member will contact you shortly. Thank you! Whether it’s giving a cancer patient a ride to chemotherapy, putting together a team for Relay For Life®, or distributing prevention and early detection information about our cancer screening guidelines, there are multiple ways you can get involved in the Society’s lifesaving mission. Many volunteers with the American Cancer Society support the areas listed below. Each program we offer supports one of the Society’s top priorities and provides valuable services to people who need our help. Do you want to do a lot of good with a little of your time? Contact your local office or submit your information below and a staff member will be in contact with you shortly. THANK YOU! This annual fundraiser brings the flower of hope to the winter days of February. Volunteers are needed to organize sales and help with deliveries. Fundraising social events may occur throughout the year. Volunteers are needed for the planning committees of these events. The American Cancer Society ensures that local, state, and federal lawmakers hear the voices of everyone affected by cancer. We advocate for legislation on the local, state, and federal level that is dedicated to eliminating cancer and the suffering it causes. The American Cancer Society Cancer Action Network (ACS CAN) is the nonprofit, non partisan advocacy affiliate of the American Cancer Society, dedicated to eliminating cancer as a major health problem. Help make a difference by joining ACS CAN and volunteering today. These two-hour sessions help patients deal with the cosmetic side effects that can occur during cancer treatment. Volunteer licensed cosmetologists are needed to conduct the sessions. A noncompetitive five-kilometer walk to raise awareness and dollars to fight breast cancer. Pledges are dedicated to life-saving American Cancer Society research, education, patient support, and advocacy programs to defeat the disease. Volunteers are needed to help with various tasks the day of the event. At various times throughout the year, volunteer cancer survivors and family members are needed to tell their stories to the media and/or at public forums. If this is something that interests you, please indicate your specific cancer diagnosis and any other information you feel is important. Relay For Life is a team event to fight cancer usually held in the spring or summer. Teams of eight to 15 people raise money prior to the event and camp out at a local high school, park or fairground to take turns walking or running around a track or path for 12 hours. Each team is asked to have a representative on the track at all times during the event. Volunteers are needed to be team members, assist in the planning of the event and help with various tasks the day of the event. 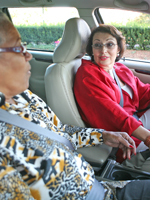 Volunteer drivers provide patient transportation to and from local treatment. Are you interested in joining the fight against cancer? Find out how you, your family, your friends, and your coworkers can get involved. It only takes a little time to do a lot of good! Contact your local office or submit your information below and a staff member will be in contact with you shortly. THANK YOU!